Did you know you can train your brain to be less stressed? Neurofeedback may help your brain to create new pathways that help you recover, feel less stress and turn on your body’s relaxation response. 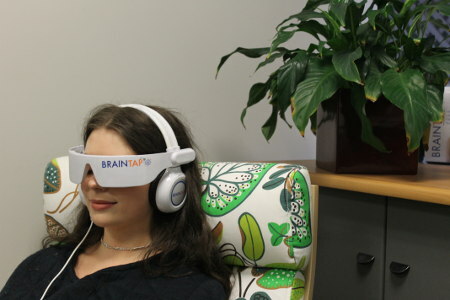 By training your brain in our office, you’ll have an easier time going into a relaxed state when you’re not here. You’ll sit in a comfortable easy chair. We’ll give you some glasses and headphones to put on. You’ll hear music, but what you can’t hear is that under the music there’s a pulse in each ear that’s slightly different. The sound waves meet and help your brain to find the correct brain wave rhythm. Lights shown in the glasses help by providing input to the brain. The total time spent in the chair is 20 minutes. We recommend our patients do this training two to three times per week before or after adjustments. You can also schedule a separate time for the training or choose to do it as a stand-alone service without chiropractic. We find that by retraining the brain, the effectiveness of your adjustment is greatly enhanced. Interested in finding out more about this advanced technology? Contact us today to schedule your appointment!